Speech sounds r: This webpage gives practical advice on how to elicit the /r/ sound in young children. Disclaimer: The techniques to be found on this page are written specifically for speech-language clinicians to use with their clientele. Teachers and parents may also find useful advice here, but the information should not be considered as an alternative to comprehensive speech assessment and intervention. If your child has speech errors please ensure they are assessed by a qualified speech-language pathologist in your local area. If you have queries about your child's speech development please contact professional organizations such as Speech Pathology Australia , the American Speech and Hearing Association in the United States and the Royal College of Speech and Language Therapists in the United Kingdom. Imitation: Imitation is an important technique when teaching a child any new speech sound. Imitation requires the child to copy the clinician's correct model of a speech sound. For instance, the clinician first engages the child's full attention and then produces a clear /r/ sound. The clinician is then silent and the child is encouraged to copy exactly the sound the clinician has produced. In many cases, of course, the child will struggle to accurately reproduce the sound. This is fine, because the child's inability to correctly reproduce a clear target sound gives the clinician a good understanding of how the child's speech error is occurring. Phonetic Placement: This is perhaps the most popular method of unearthing new and correct speech sounds in young children. Essentially the clinician demonstrates to the child how to correctly place their tongue, teeth and lips - their articulators, in order to produce the correct speech sound. The techniques of imitation and phonetic placement will be explored on this page. 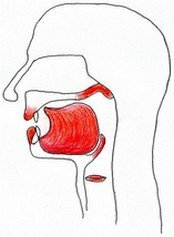 The/r/ phoneme is a voiced (larynx vibrates) palatal glide. When you produce the /r/ phoneme and sustain the sound you should notice that your larynx vibrates. Also note that the breath stream flows over the top of the tongue and then out, While the tongue touches no structures, it is elevated near to the palate (roof of mouth). The tongue tip is very close to the alveolar ridge but does not contact the ridge at any point. The /r/ phoneme is referred to as a palatal glide because the breath stream flows through the narrow gap between the top of the tongue blade and the palate. A common sound error is the /r/ misarticulated as /w/ or as /j/. The /l/ sound is a later developing sound, so what young children generally do is substitute earlier developing sounds such as /w/ and /j/ in place of the /r/ phoneme. This is considered normal development in younger children, but can become a problem if the child continues to substitute /w/ or /j/ for /l/ in the early school years. For example, 'the boy ran on the road' becomes the boy wan on the woad. Demonstrate to the child what a typical /r/ sounds like. You do this by sustaining the /r/ sound and then explain to the child that the /r/ sound is made by the tongue being slightly at the back and in the middle of the mouth. Emphasize that the tongue doesn't touch any structures in the mouth, but is close to the top of the mouth. It may be difficult for a younger child to conceptualize this information so an illustration has been included displaying where the tongue should be to help the child to visualize correct tongue placement. Wayne Secord has a simple and highly useful technique for explaining tongue position to a young child. Hold your left hand in flattened horizontal position with the palm facing down. Next, place your right hand beneath the left hand so that the palms face each other. The left represents the hard palate and the right hand beneath the left hand represents the tongue. Keep your left hand still, and with your right hand move it slightly back and curl the fingers up so that they almost touch the palm of the left hand. You can also demonstrate to the child the contrast in mouth shape and movement between the /r/ and /w/ phonemes. 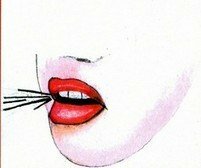 The /w/ uses a large mouth movement and the tongue lies virtually still, whereas during /r/ production the mouth is just slightly open and still.